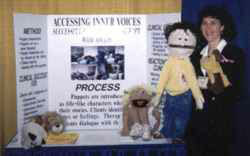 DR. VIZZINI's NEW WEBSITE at Freedomthroughtherapy.com and Drvizzini.com can provide you with the most recent information ABOUT HOW THIS DOCTOR OF THE HEART USES PUPPETS IN THERAPY, INCLUDING WORKSHOPS AND TRAININGS. The question that is asked of me most is, "Do adults really work with puppets?" I can resoundingly reply, "Yes, very successfully!" For centuries psychotherapists have worked with their clients to establish trust in the therapeutic relationship, and thus overcome their clients' natural defenses to change, growth, or insight. Ego-defense mechanisms, as hailed by the psychodynamic school of thought, have become blockades to true freedom. Some of these defenses: repression, denial, reaction formation, projection, displacement, rationalization, can become lifestyle coping mechanisms. However, the therapist often struggles to go around them, break through them, or lift them. When the client is working with the therapist to overcome defenses, he/she is seen as compliant Whenever the client is unable to or unwilling to by-pass defenses, he/she is seen as resistant. The experience of puppet therapy with adults has successfully provided a means to disarm client�s resistance in a quick and easy fashion. There seems to be a regression in the service of the ego which facilitates adult play. The ability to quickly unmask one's defenses allows the adult to reach core issues. Childhood issues and feelings can resurface readily. The therapeutic image of offering a hand up and out is germane in puppet therapy where the client's healing is literally at the counselor's fingertips. The puppets have allowed many of the clients with whom I have worked the freedom to disarm defenses. They become free to face their pain and joy as never before. Steinhardt (1994), a follower of Winnicott, concluded that puppets allow spontaneous symbolic emotional expression, which otherwise may not occur, within a protected framework. (p.205). The experience of puppet therapy as described by my clients is innately spiritual. They cite a transformative factor as part of their experience. Amorin and Calvacante state, ".... we believe that within the play element dwells an ulterior meaning, something experienced as magical or transporting which surrounds the concreteness of play itself" (1992, p.153). As puppet therapy with adults unfolds, I sense the touch of the sacred. Inner voices are accessed. I remain in awe of the healing I have witnessed as a puppet therapist. Business phone & voice mail is 443-831-1948.